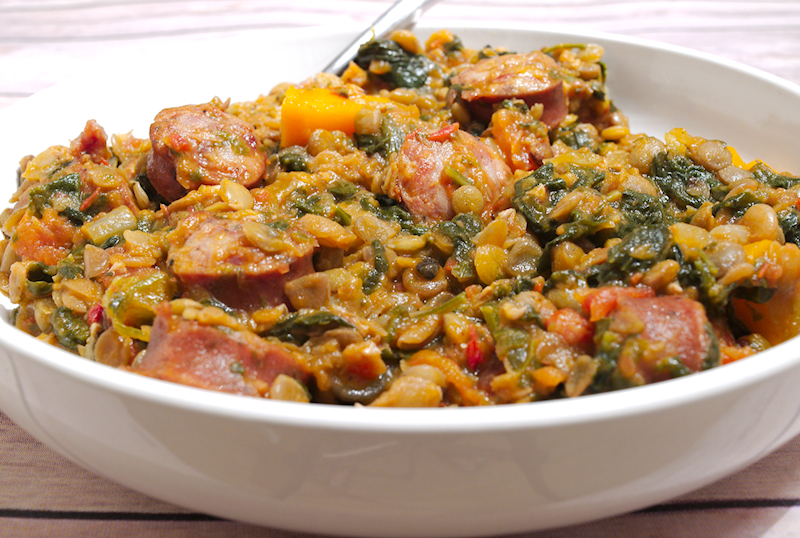 A hearty recipe for brown lentils with smoked sausage and spinach stew. A guilty pleasure with a boost of iron. 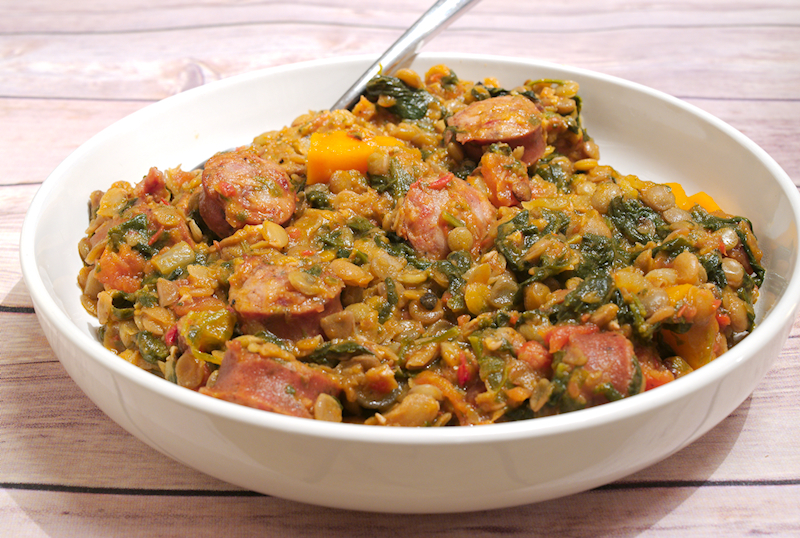 Lentils and sausage! Strange combination, isn’t it? 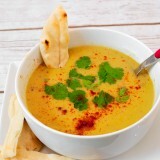 One would eat a lentils soup or salad as a part of a healthy diet. Add sausages and you ruin everything! 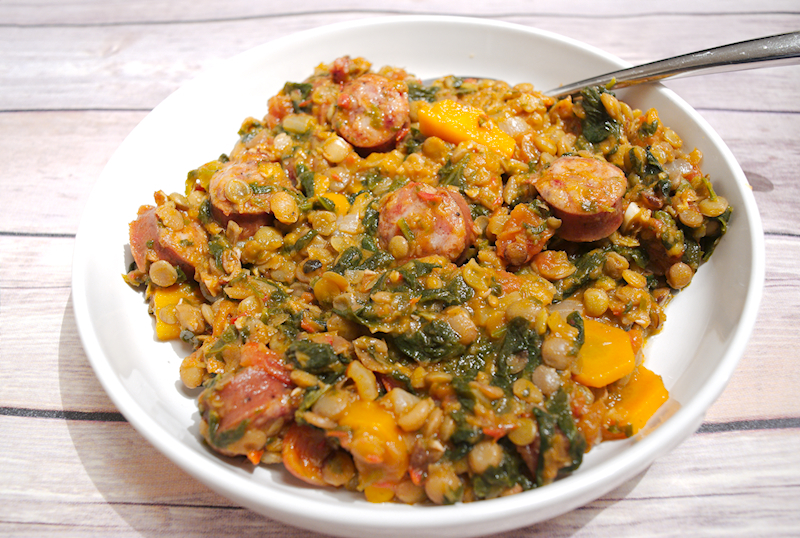 You may be right but many of us would like to enjoy the benefits and taste of lentils while having a dose of meat in there. Interestingly, the tastes blend quite well. 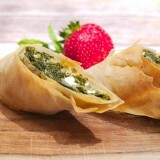 Add some spinach and you have an iron and protein boost. The choice or sausages is important but not critical. They need to be hard-is so you can slice them and don’t get destroyed while cooking. English sausages are not good for this dish. You could try some Italian or Polish sausages. During my last visit in Greece, I visited a Cretan deli and bought some locally produced sausages. The ones I used where made following a recipe from a local monastery in Crete. Very good quality meat (pork) and herbs from the Cretan mountains. Lucky me! If you have been following my recipes, you should know that I always add some fresh tomatoes when I make a red sauce. If I was in Greece or Italy, I would only use fresh tomatoes, especially in the summer when they are juicy and sweet. Here, I have to pay lots of money to buy some decent tomatoes but definitely worth it. So I use a combination of fresh and tinned tomatoes. Not bad. 1 ½ cup brown lentils. 300 gr (10 oz) spicy smoked sausage. 300 gr (10 oz) fresh spinach. 1 ½ yellow onion chopped. 1 red chili pepper chopped. 2-3 ripe and sweet tomatoes. 200 ml (7 fl oz) chopped tin tomatoes. ½ cup of extra-virgin olive oil (maybe a bit more). Boil the lentils in a pot with plenty of water for ~ 15 minutes. Drain and set aside. 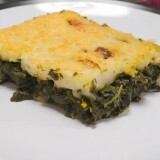 Wash the spinach and chop it coarsely. Add 2-3 tablespoons of olive oil in a deep pot on medium heat. Cook the spinach for ~ 10 minutes. Drain it and keep aside. Wash the pot from the spinach juices. Cut the sausages in pieces ~ 1 inch thick. Add 1-2 tablespoons of olive oil and fry the sausages on medium heat until golden brown. Place the cooked sausages on a plate covered with kitchen towel and set aside. Add the remaining olive oil in the pot and add the onions on medium heat. Scratch gently the bottom with a wooden spoon to release the aromas from the sausages. 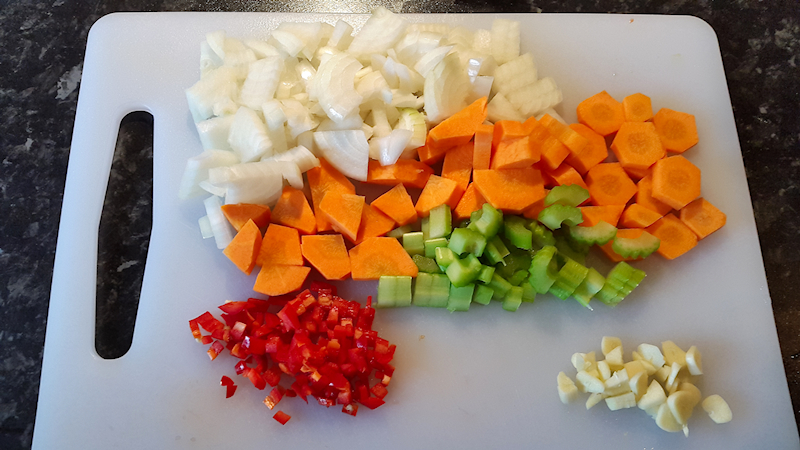 After ~ 5 minutes, add the carrots, celery and chili pepper. Season with salt and pepper. Cook until the vegetables start getting soft. Add the fresh tomatoes and parsley in a food processor and make a nice paste. Add the garlic and cook for ~ 1 minute. Give it a good stir. Add the cooked sausages, fresh tomato paste from the processor, chopped tomatoes from the tin and the beef broth. Season with salt and pepper and give it a good stir. Bring it to boil and let it cook for ~ 10 minutes. Add the lentils back to the pot and stir well. If the juices don't cover the lentils, add some hot water. Set the heat to low-medium. When the vegetables are almost cooked (~ 30 minutes), add the spinach and stir well. Cook for another 10 minutes until lentils and vegetables (especially carrots) are soft and melting in your mouth. 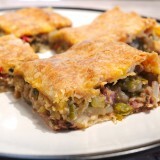 Serve the lentils warm with nice bread and Feta cheese.